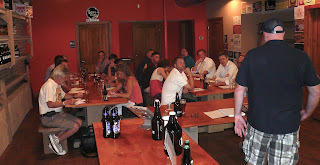 Yep, that's me, one of twenty classmates who took advantage of The Growler Station's Beer 101 class during this past month. The first of its kind, the weekly class featured three sessions, led by GS' own Big Jon Richards, covering everything from the history of beer, brewing steps and ingredients, and the incredible variety of styles, to food pairings. Ask him about it sometime if you are interested. I can attest to his knowledge cause I'm studying for the exam myself and it requires some serious study (and not just beer drinking!). Each session included numerous tasting opportunities (for educational purposes only, of course) of examples that were relevant to the evening's topic. This gathering of beer enthusiasts included several home brewers so the knowledge level of the class varied but all had one thing in common: we all love good beer! And I for one was introduced to at least 12 new brews within a context that made me appreciate them even more. For that reason alone, I rate the class a success. So, let's meet some participants at the class finale and I'll wrap up with some of the salient points that Jon made during the course. John Carper, a home brewer who works in Greenville but lives and brews in Virginia, brought in two of his creations for us to sample: a watermelon ale and a double chocolate oatmeal stout. Both were very popular, one person especially liked the watermelon ale and thought it would be a good "gateway" example for newbies just acquiring a taste for craft ales. A big benefit of a class like this is the opportunity to ask questions, especially of the home brewers. You can learn a lot from their experiences, good and bad. Andy Kerechanin poured his own Honey Brown, using recycled Coke bottles. Clarke Middaugh, center, brought a mystery stout; he'd lost the label! Andy Griscom has a great beer/food pairing suggestion: Pumpkin w/terriyaki flavored food. Green Flash Hophead Red w/ chorizo. Quest Ellida IPA with horseradish cheese. Avery Hog Heaven Barley Wine with stilton. Vistory Festbier with Soppresetto slices. All worked well together as foretold by Jon and of course, the obligatory brownies paired deliciously with the Imperial Stout by Victory, their Storm King. 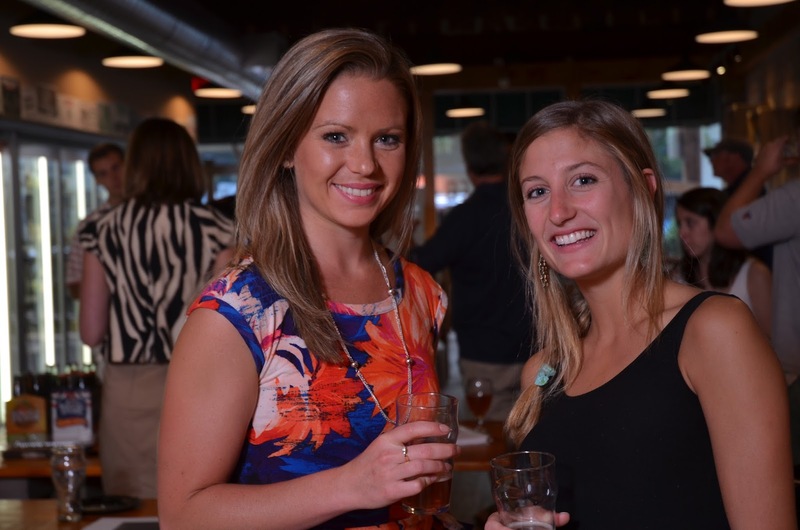 Nicole and Kelly (l-r) both enjoyed the opportunity to try new brews. Clarke tried Andy's Honey Brown; a collaboration in the making? Jon was generous with his pours and didn't mind me asking for seconds! The samples lineup for the Styles class. Rare chance to try these in one session. So, wrapping up, what did I learn (or what do I remember) from these three sessions? Beer has been with us a very, very long time and it's just getting better and better. A Kolsch is ale that is warm fermented but lagered at cold temps which gives it a bit of both characteristics. Anchor Steam of San Francisco created its own style, California Common tho there are now several brews with that style designation. And, finally, as far as food pairings go, Big Jon says Belgians go with anything. And with that, I think I'll go have a beer! !